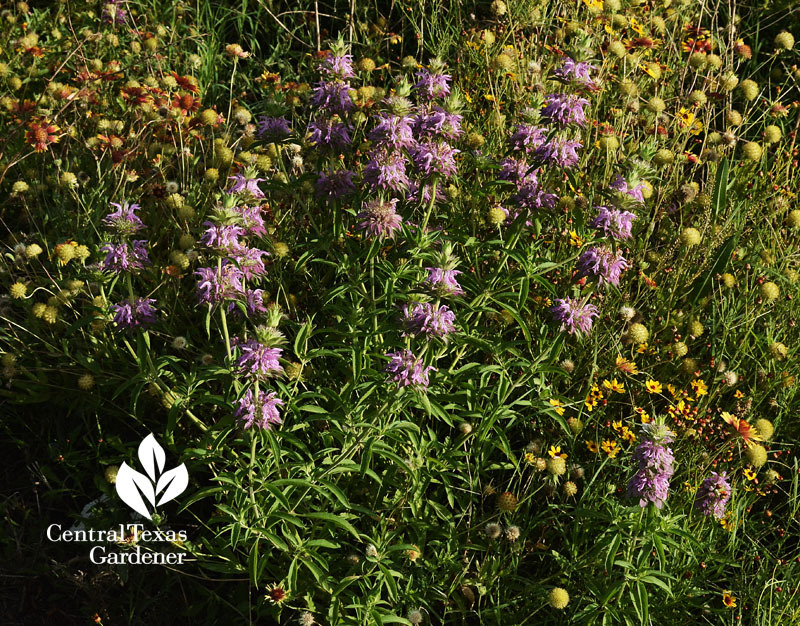 The latest round of wildflowers is in gear, like bee balm (Monarda citriodora) while the early birds are going to seed. 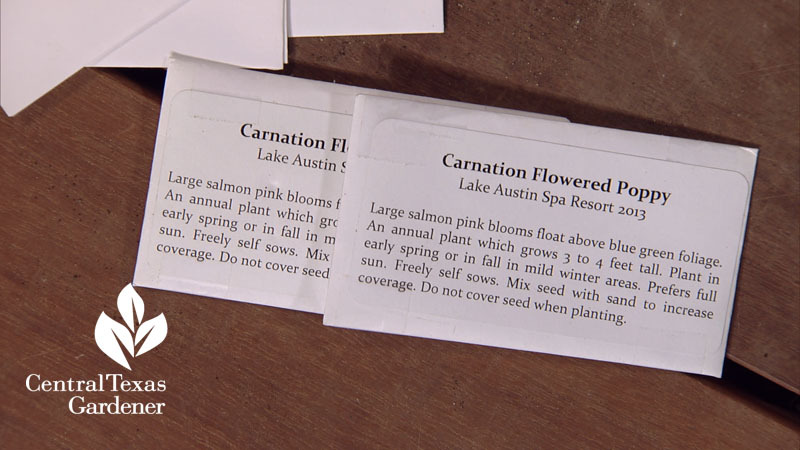 This week, Trisha Shirey shows when and how to collect and dry seeds for next fall, including the bucket technique, my fave. 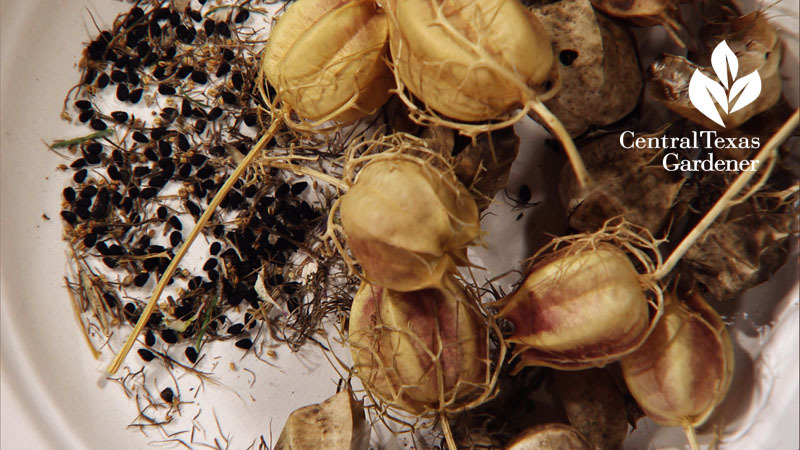 To separate seeds from debris, you can use a fine strainer and even sift in front of a fan to blow away the hulls. 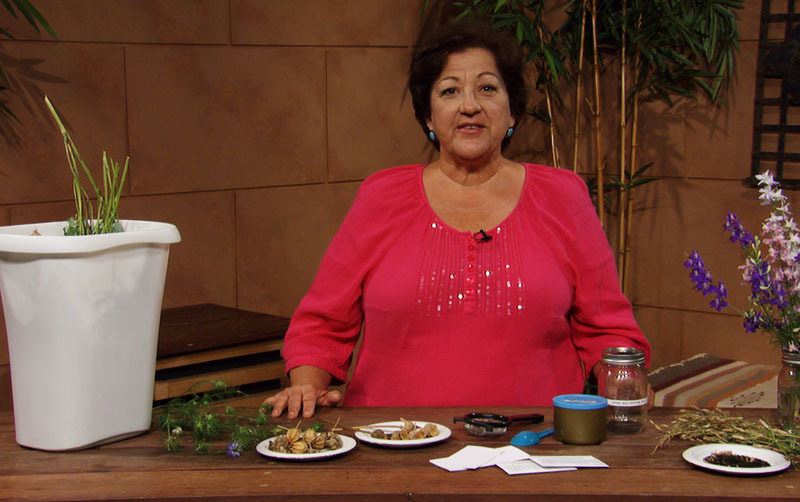 Trisha cautions: Always store in paper bags or jars after you’ve dried the seeds in shallow containers in the house. 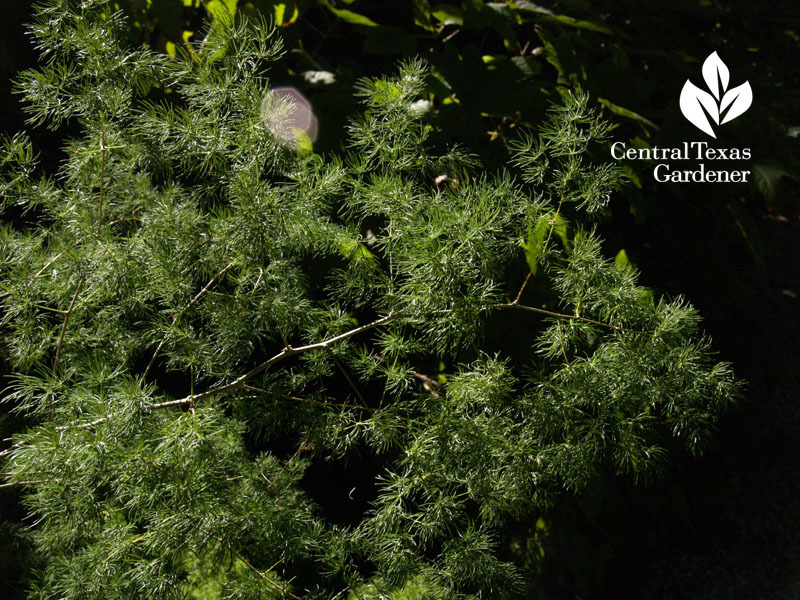 Plastic bags can retain residual moisture, and if the seeds mildew, they won’t germinate. 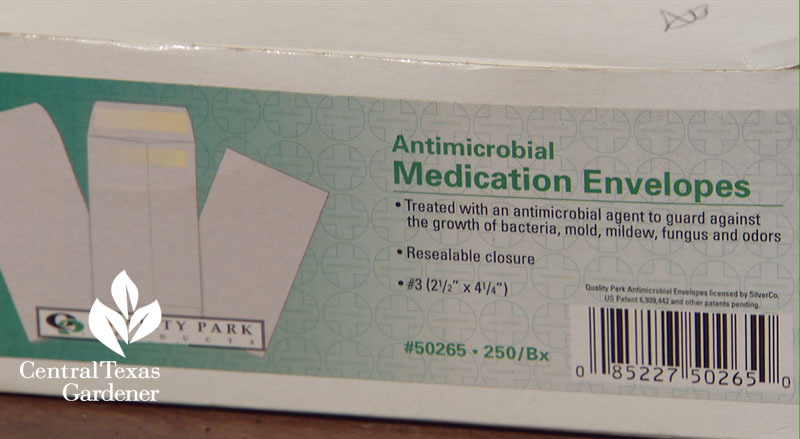 Check out these medication envelopes, available online to dispense to friends with your prescription! 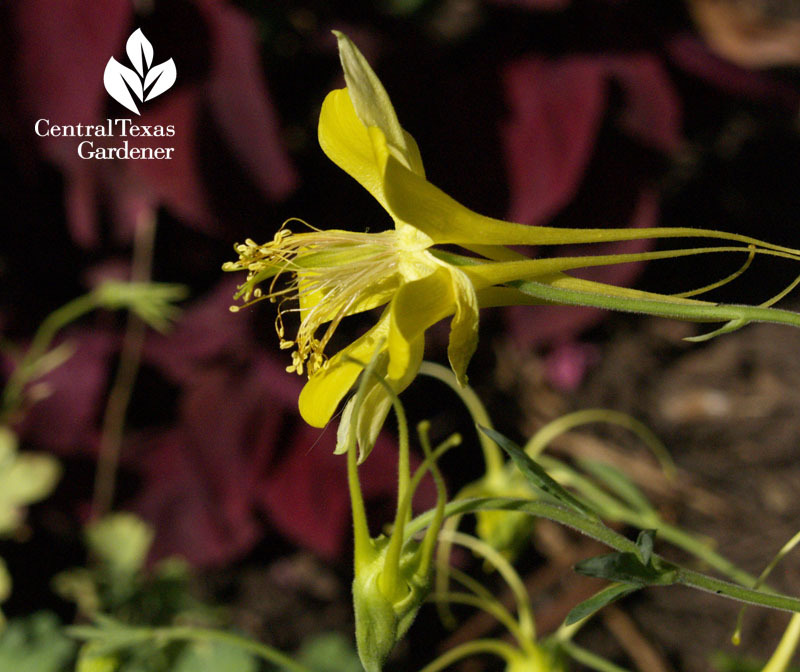 In shady areas, it’s time to collect seeds from columbine. 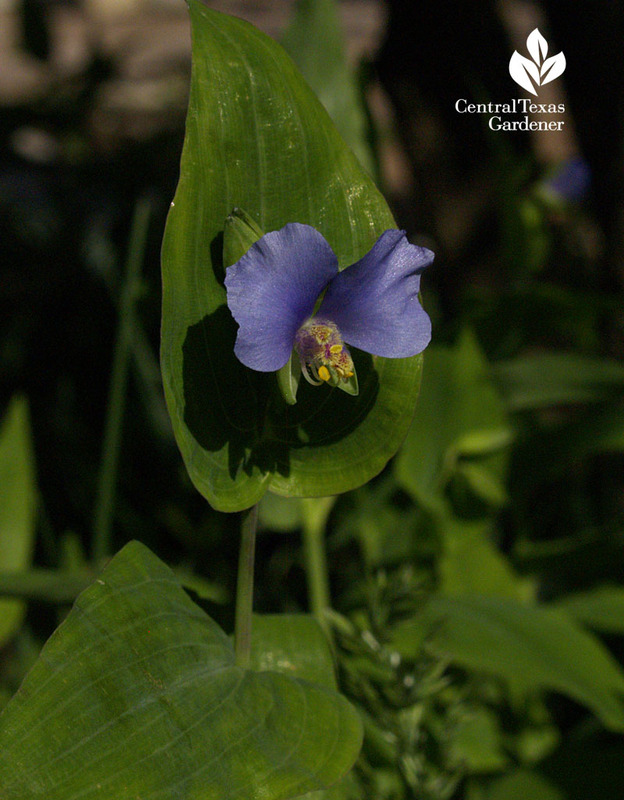 And widow’s tears (Commelina erecta), if they haven’t already scattered. 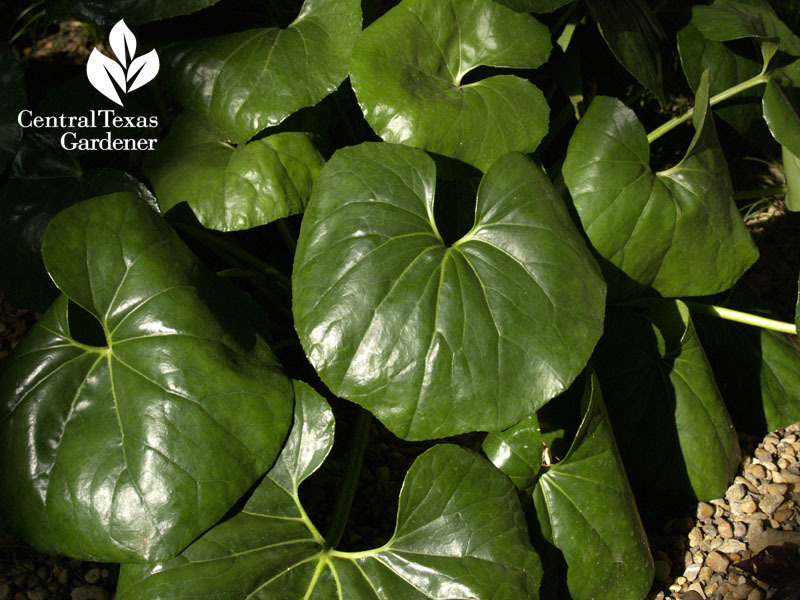 Shade plants TOP all the questions I get. 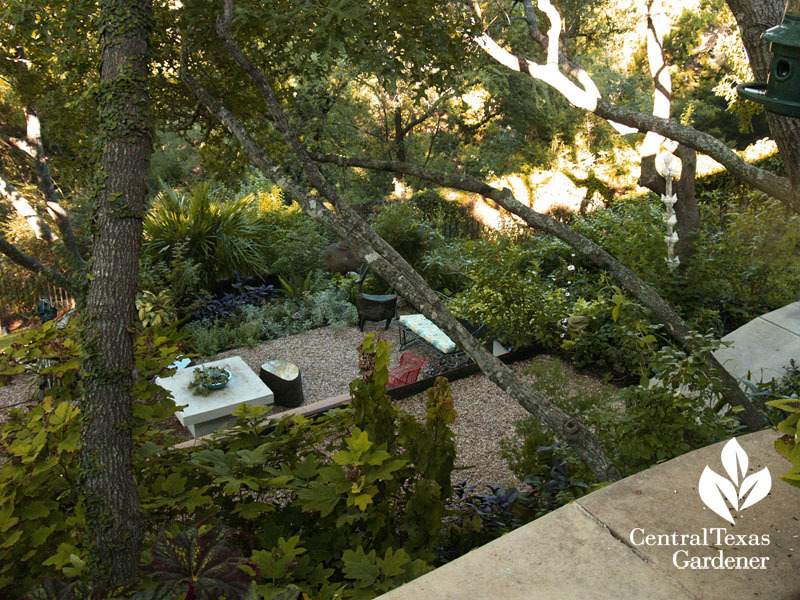 Here’s a charming spot in Lucinda Hutson’s garden under a gingko tree, where she quilted ferns, ajuga, Katie ruellia, Wedelia tribolata, creeping jenny, violets and oxalis. 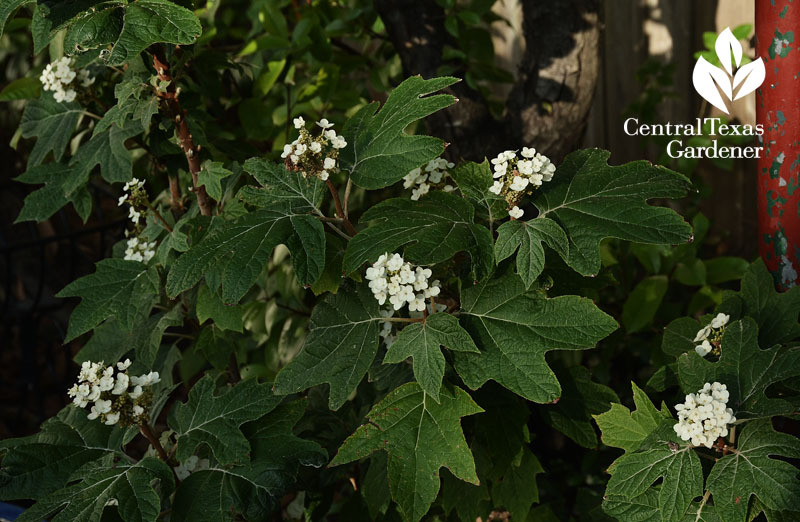 Recently I learned at Ten Acre Organics that the oakleaf hydrangea they inherited is quite drought-tough. 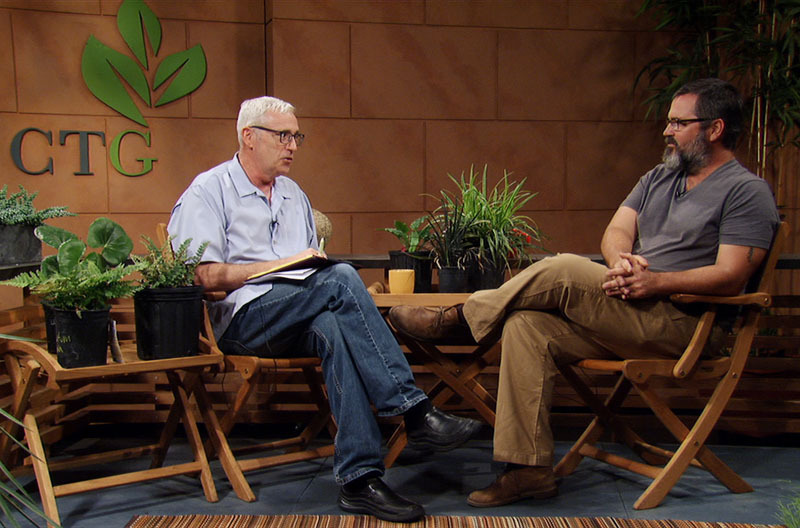 Jon Hutson from Tillery Street Plant Company dispels some of my concerns about drought & cold-hardy plants for shade when he joins Tom to widen our shady horizon. 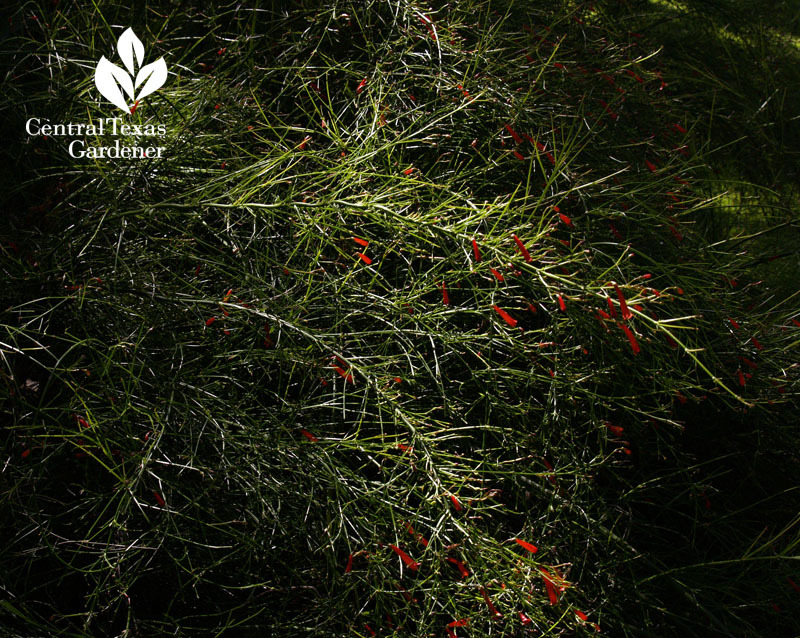 I was astounded to learn that firecracker fern (Russelia equisetiformis) works in some shade and heavy soil. Of course, it’s going to stretch a bit, but that just adds to the cascading affect. I’ve admired ligularia in gardens for YEARS. I figured this would be a water hound. Not so, he tells us. Another I’ve drooled over after seeing it in several waterwise gardens: Plum yew (Cephalotaxus harringtonia ‘Duke Gardens’). 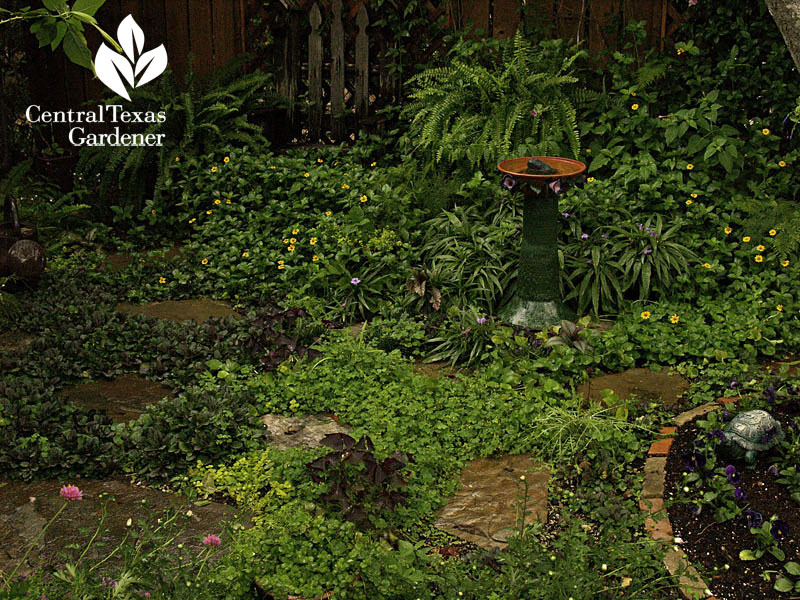 Now, Jon tells us, this low-growing groundcover is more available outside the landscaper trade. 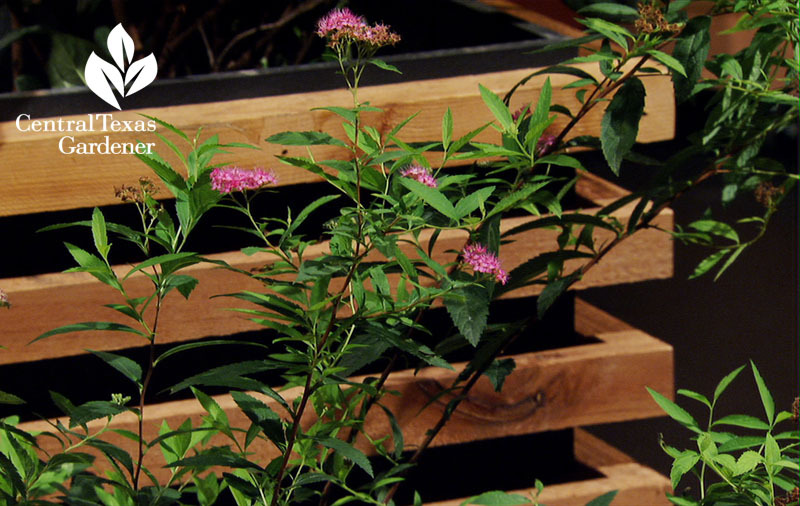 One I never would have suspected is Anthony Waterer spiraea that blooms in summer! Jon’s got a ton more, so here’s his list. 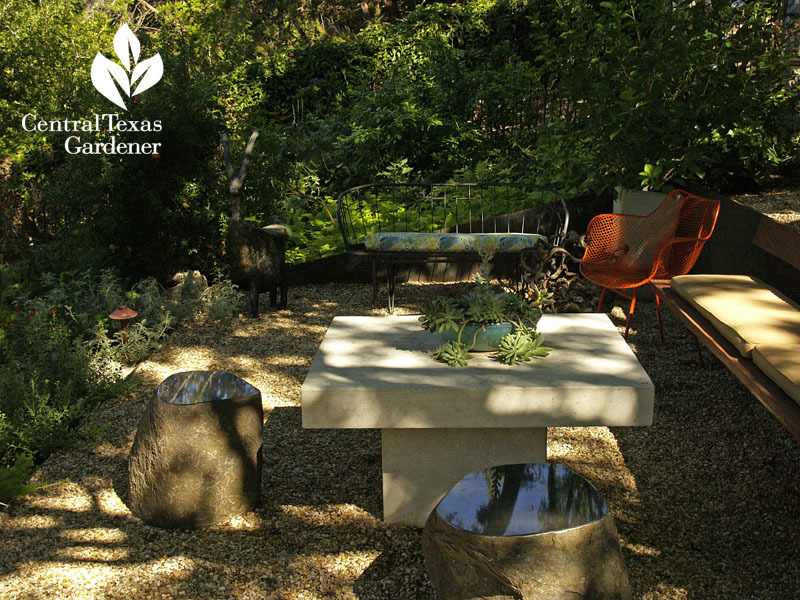 Or just head out to Tillery Street Plant Company and hang out in the shade to peruse your favorites. 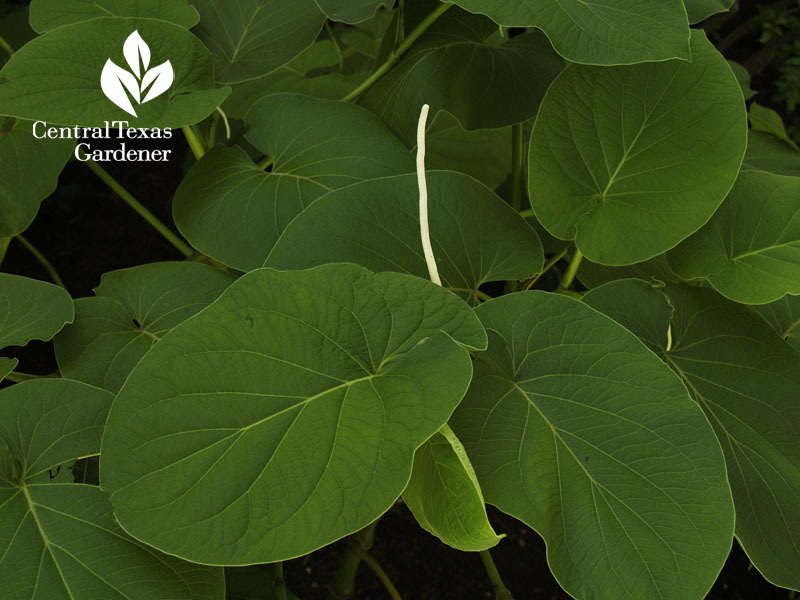 On tour, Lynne Dobson grows many on Jon’s list, like root beer plant (Hoja Santa). 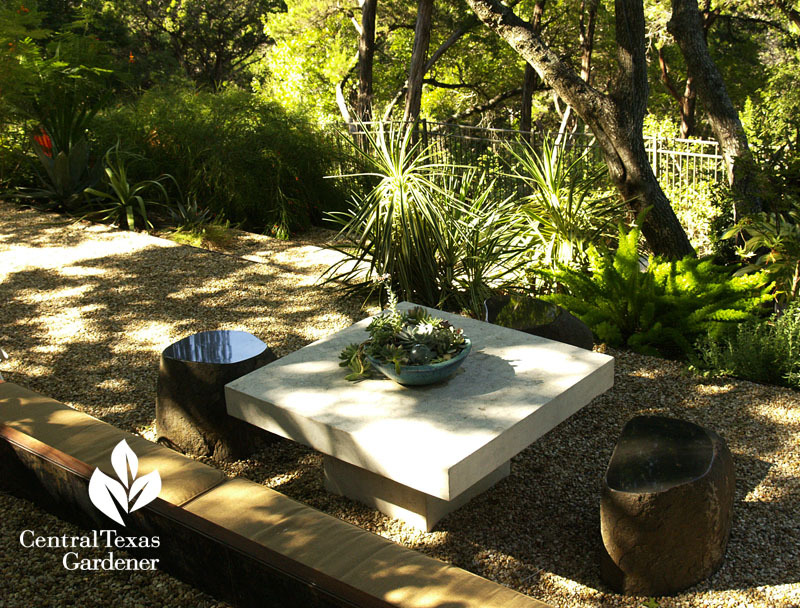 When she and husband Greg Wooldridge bought their house, the backyard was an unwieldy slope of lawn in lots of shade. 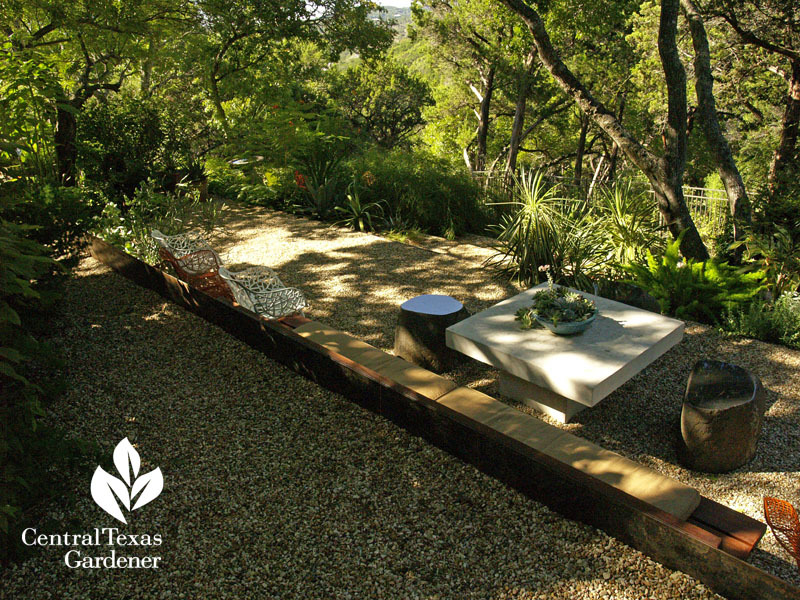 Landscape architect Bill Bauer gave them access on every level. 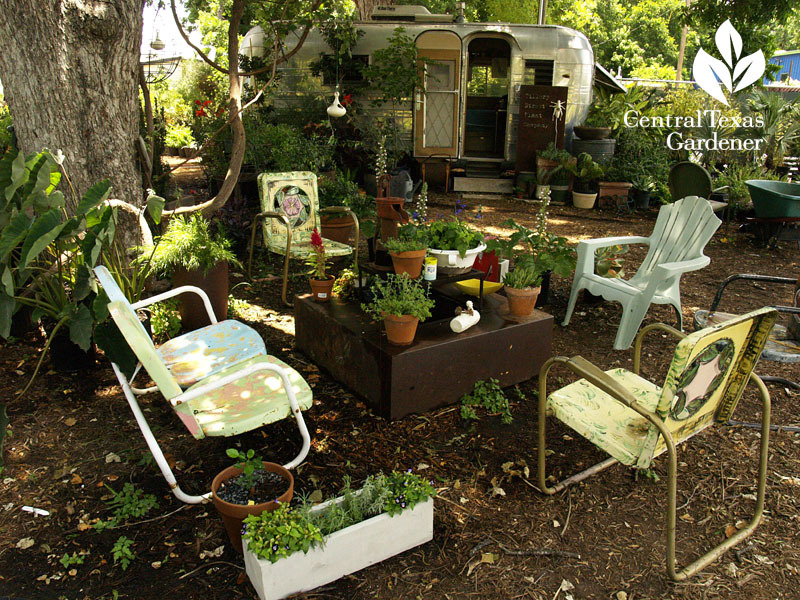 Lynne filled them with serene enchanting places to live and talk. 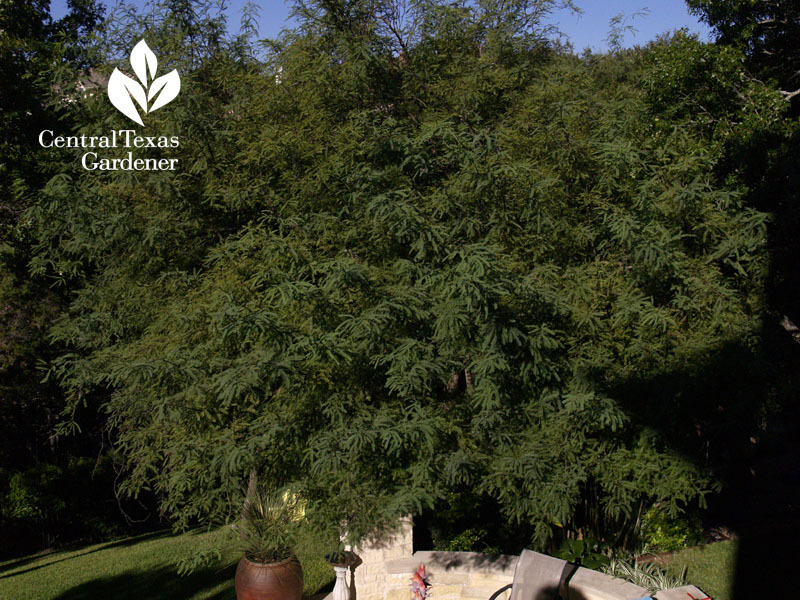 Her Chilean mesquite tree gracefully transitions the broad sunny patio with the cozy, shady living room. As a professional photographer, with a deep and rich connection to nature’s gifts, Lynne designs patterns to appreciate from every view. 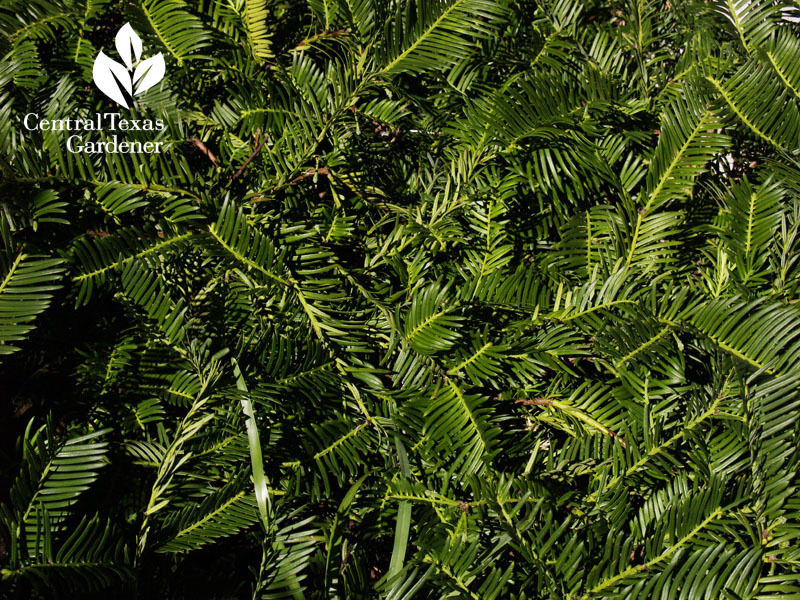 She’s mindful of close-up wonders, like this Ming fern. Growing up on the Gulf coast, she symbolizes her mother’s love of shells with a sculpture by artist Emily Tracy-Haas. Lynne charms every nook. 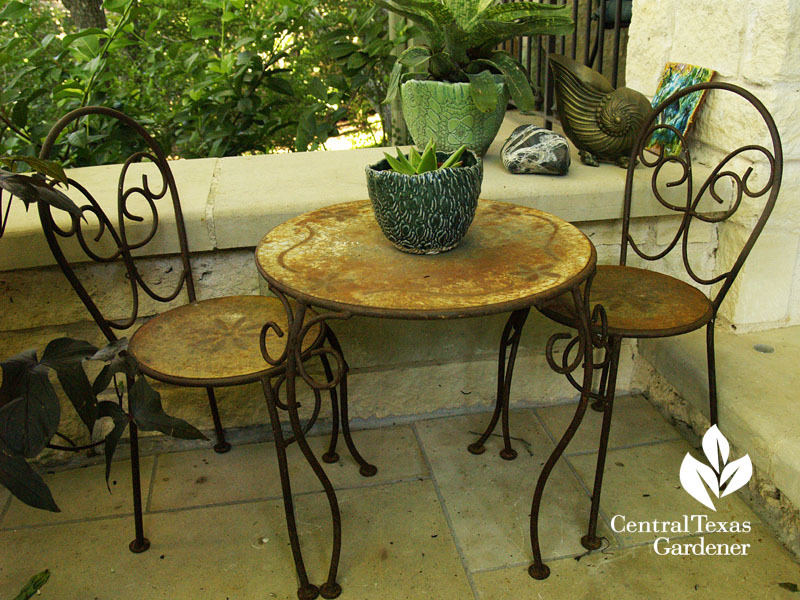 She likes to pair succulents with Austin artist Rick Van Dyke’s containers. 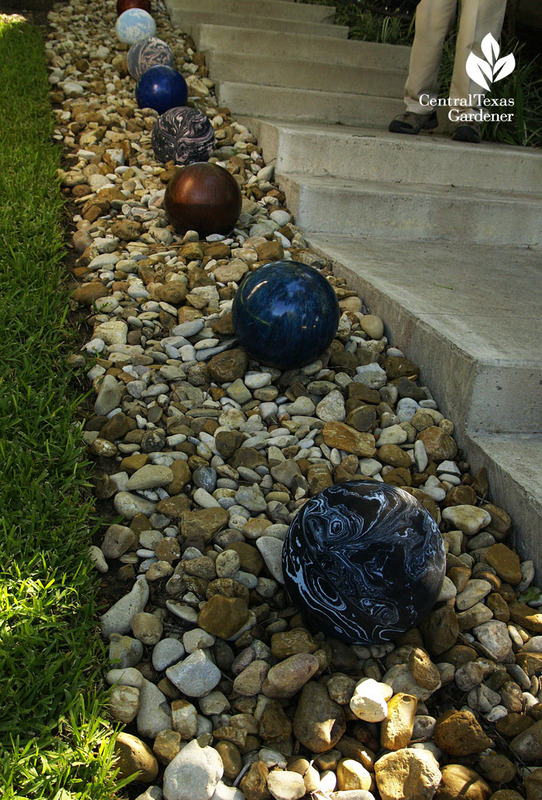 To have a ball with the side yard’s functional drainage control “gutter,” Lynne dipped into Greg’s bowling ball collection. 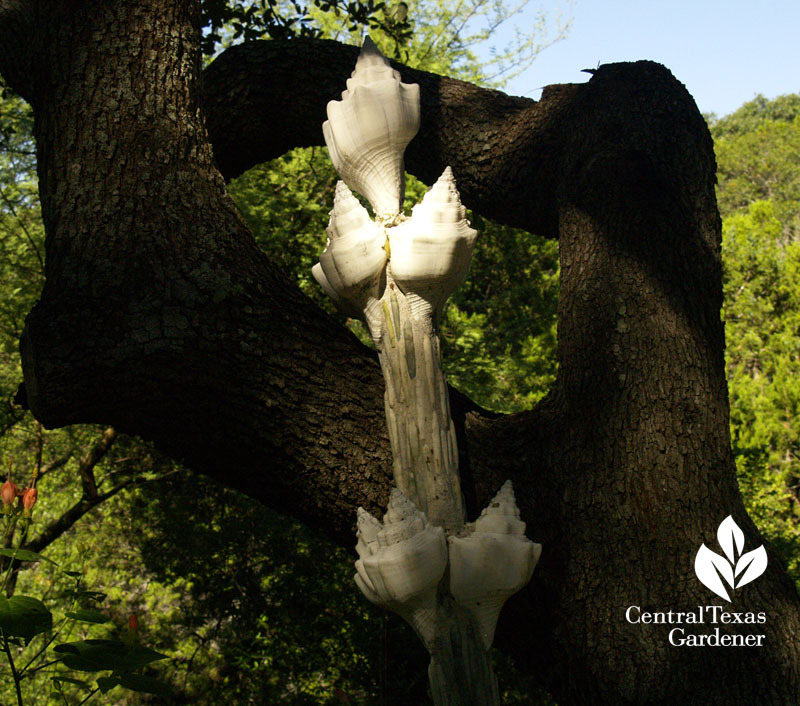 “They’re fun and structural and they withstand the weather just great. 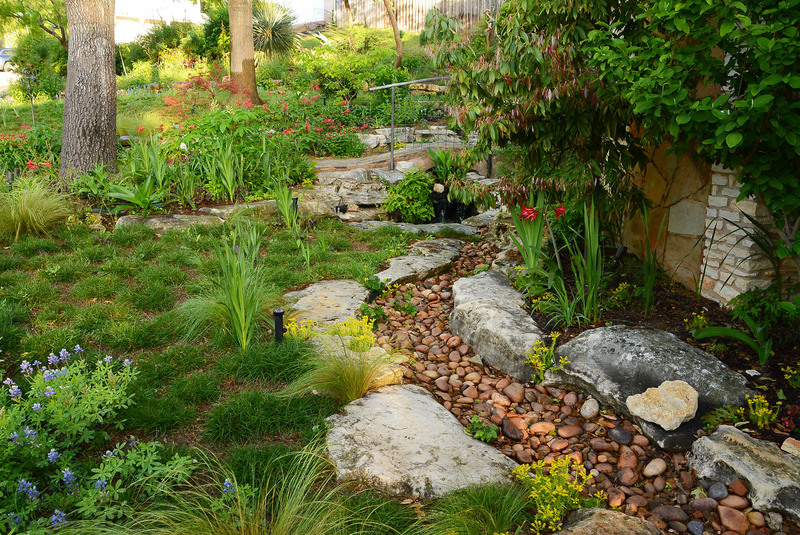 It was boring with just the rocks for drainage,” she says. 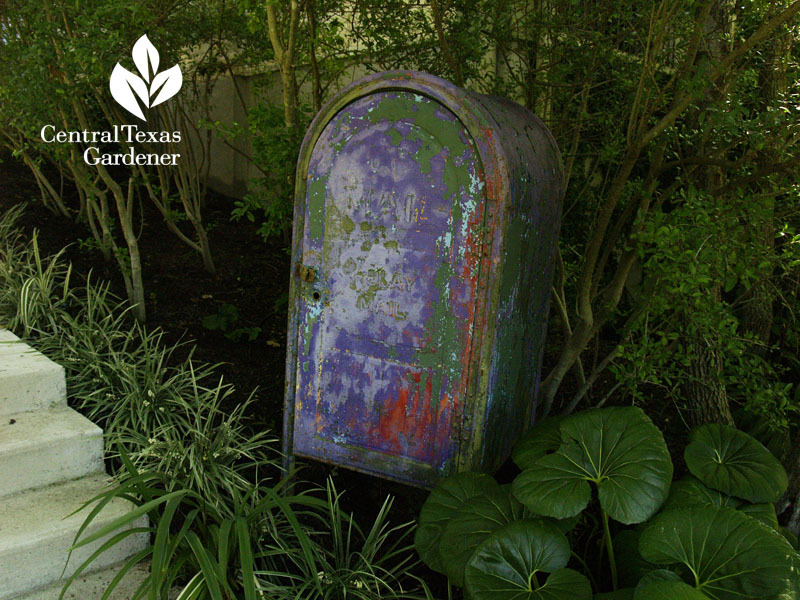 A classic mailbox delivers garden tools and supplies midway between gardens. 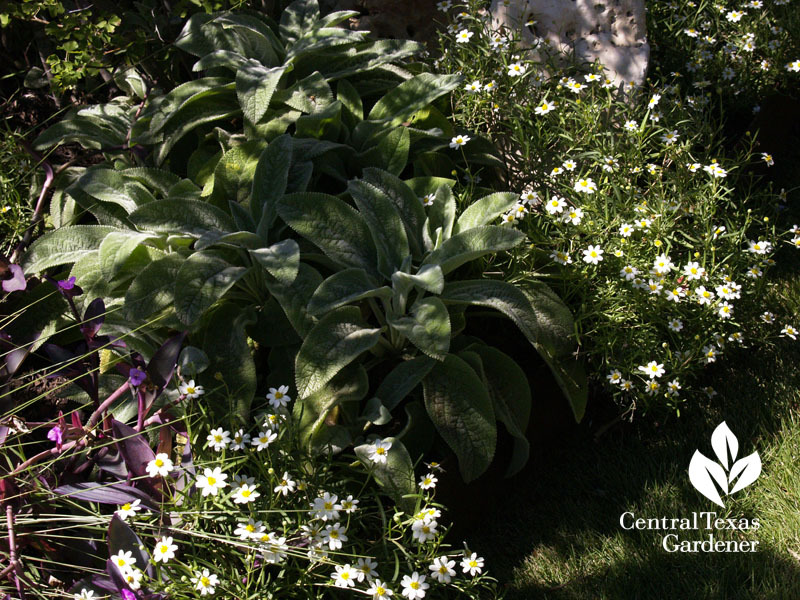 Certified arborist and designer Molly Wood assists with plant resources and big maintenance jobs, like the yearly application of turkey compost for plant health and water retention. 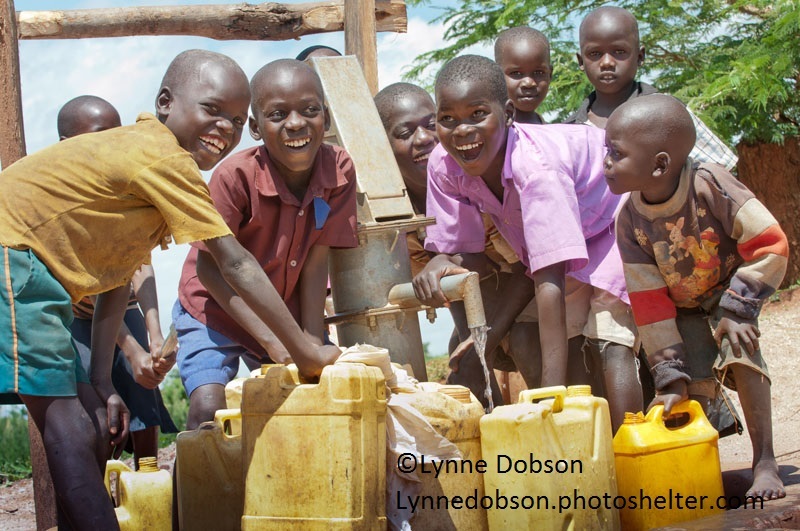 Lynne also sees a lot away from home as a humanitarian photojournalist and activist for several non-profits. On her website, she documents her missions in Africa, including Water to Thrive, Free Wheelchair Mission and the African Children’s Choir.